The story of Abuelo’s begins in the summer of 1989, when entrepreneurs James Young, Chuck Anderson and Dirk Rambo opened the first Abuelo’s Mexican restaurant in Amarillo, Texas. Our founders’ goal was simple. To open a restaurant serving delicious, made-from-scratch Mexican food at everyday prices, as well as to create a place where guests of all ages could come together to experience the unique flavors, along with the art and culture of Mexico. What came to life was a truly unique dining experience – authentic tastes of Mexico, with family-style dining in an elevated, yet comfortable setting. Nearly three decades later, with several restaurants located in 13 states throughout the nation and more openings planned for the future, the success of Abuelo’s has surpassed the founders’ original dreams. Each Abuelo’s restaurant is designed as an open-air Mexican courtyard with a mix of both modern and traditional Mexican decor. We are passionate about our made-from-scratch dishes, each one made from the heart and crafted with pride from Chef Luis E. Sanchez’s family recipes. We use only the freshest, finest ingredients in all our dishes from our scratch-made salsas, sauces, tortillas, and sides, to our hand-rolled enchiladas, traditional TexMex items and unique House Specialties. At Abuelo’s, our team members have an incredible sense of pride in everything we do, from the food we serve to the gracious hospitality we provide. On each visit, we’re happy to “welcome you into our home” and our passion ensures you have a great experience each and every time. It’s this dedication to our food and service that has secured Abuelo’s ranking as the #1 Mexican Restaurant in America since 2006 by consumers, as published in the nation’s most respected consumer rating magazine. The Abuelo’s story is simple. Extraordinary flavor, impeccable service and memorable experiences – plus everyday value. We invite you to discover new tastes, share, laugh, celebrate traditions, make new ones, and to be our friend and neighbor. So come, stay awhile! “I love to re-create recipes from our past, recipes from our families and from our friends." Being a good community partner is more than just an idea. 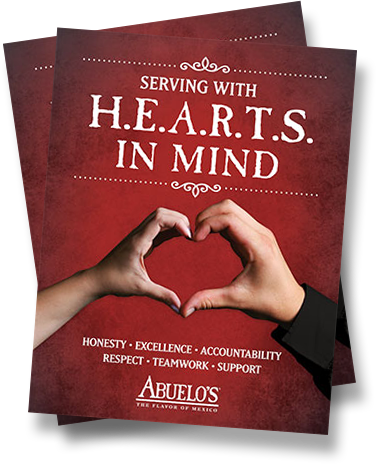 At Abuelo’s, serving with HEARTS in Mind is a part of our daily culture. Abuelo’s sponsors and participates in numerous charitable programs throughout the country that benefit children, education, our military and more. From fundraisers to charity golf tournaments to in-store events, Abuelo’s believes in giving back to the communities we serve. Contact your local Abuelo’s regarding sponsorships or donation requests. Please have a written proposal prepared to submit for review. At Abuelo's, one of our core values is "Support" - and that means always being there when one of our team members needs assistance. The Giving HEARTS Foundation is on entirely, team member-funded program designed to assist team members in a time of tragedy or crisis.